Poles began trickling into the Cattaraugus County city of Olean in the early 1890s. Finding work at the Acme Glass Factory, Kinley Tannery, train car shops, and oil refineries, the community steadily grew during the turn of the century. These early Polish families began attending St. John’s Roman Catholic Church until their numbers reached a point that a Polish priest had to be sent to assist with the Masses. Fathers Francis Kasprzak, Louis Chodacki, and Ladislaus Hordych all served in that capacity. In 1902 a census of the Polish parishioners was taken by Father Hordych and Michael Subjeck. Seeing the results the bishop approved the new parish, and promoted Father Hordych as priest of Transfiguration. On June 22, 1902 a cornerstone laying ceremony was held as the parish began construction of its simple wooden home. Five months later the structure was complete and the bishop, parish trustees John Suda and Matthew Szadlowski, and the 42 families on the parish register, were all present for the dedication of the building on November 12, 1902. The parish would see Michael Suzcan as its first baptism, Michael Warge and Ann Kazmir as its first married couple, and Catherine Balus as its first funeral. With the church well established Father Hordych was transferred to Holy Trinity in Nanticoke, Pennsylvania and in his stead came Father Constantine Brzoska from Plains, PA. Brzoska’s time at the parish would be short with Reverend Leonard Podlewski replacing him in 1906. Father Leonard oversaw the construction of a combination school and convent in 1908 and invited the Felician Sisters to teach. The first year the Sisters instructed 127 pupils in their new home. Podlewski would also erect a rectory for himself the same year. Father Thomas Gwozdz moved into the rectory in 1912 and around the same time, Prof. Andrew E. Sermack began his tenure as parish organist, a position he would hold for over a quarter century. In 1937 Father John Glazik was appointed pastor of Transfiguration. During his time as pastor of Transfiguration, Father John redecorated the church, remodeled the school-convent, and refreshed the rectory. He also oversaw the golden jubilee of the congregation and completely paid off the parish debt. Father John’s successor Father Rojek had a new parish school built and dedicated in 1958. The new building, designed by Robert Stickle of Cleveland, Ohio had five classrooms with plenty of space for the 121 students attending the school. 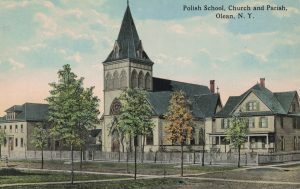 From the high point of opening the new school, Olean and its Polonia began a decline in the 1960s as industry and residents left to find new opportunities. In 2009, as part of the Diocese of Buffalo’s Journey in Faith and Grace, Transfiguration Parish was merged with St. John’s and the Transfiguration site became an oratory. 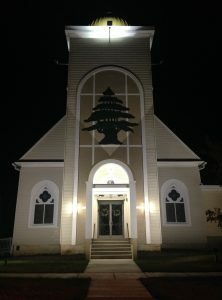 In the afternoon of August 27, 2011 a fire began near the altar of St. Joseph’s Maronite Catholic Church on Fourth Street in Olean. Over the course of the day the 92-year-old structure burned to the ground. Without a home the parish soon began to use the Transfiguration Oratory for Divine Liturgy as they struggled with what to do next. After 14 months Father Anthony Salim and his congregation came up with two options, rebuild on their old location or buy an existing structure. After consulting with Bishop Reverend Gregory Mansour it was decided to purchase Transfiguration and remodel it in an Eastern Catholic style. Despite the remodel, some vestiges of Polonia still remain in the parish of St. Joseph’s. "50th Anniversary Of North Olean Church Is Observed Sunday." Olean Times Herald [Olean, NY] 23 June 1952: 3. Print. Committee. Anniversary Program Rev. John F. Galazik June 15, 1919 June 15, 1949. Olean, NY: Transfiguration Church, 1949. Print. Committee. Dedication, October 19, 1958, Transfiguration Parochial School. Olean, NY: n.p., 1958. Print. Committee. Pamiatka Srebrnego Jubileuszu Kaplanstwa Wiel. Ks. Jana F. Glasik 1919 1944. Olean, NY: Transfiguration Church, 1944. Print. "Father of Year Honor For Andrew Sermak." Olean Times Herald [Olean, NY] 21 June 1948: 3. Print. "Fr. Hordich Is Transferred." Buffalo Courier [Buffalo, NY] 9 Jan. 1904: n. pag. Print. Michel, Christopher. "St. Joseph's Church to Purchase Former Transfiguration Oratory. "Olean Times Herald. 03 Feb. 2013. Web. 23 Jan. 2017. "Parish Of Church Of The Transfiguration To Observe Jubilee." Olean Times Herald [Olean, NY] 20 June 1952: 4. Print. "St. Joseph's Fire." Olean Times Herald. N.p., 28 Aug. 2011. Web. 23 Jan. 2017. Transfiguration Church Olean New York. Olean, NY: n.p., 2002. Print.